Alan Gosling and John Craythorne went back to school for a day on 8th March. We were invited to spend a day talking to and interacting with all the pupils and staff at Holly Meadows Primary School, Pott Road, near King’s Lynn. With a variety of illustrated guides to Space, the Solar System, and the Universe at large, we also gave the youngest children the chance to be a part of a scale model of the Solar System using our 2m high image of the Sun and various fruits to represent the planets. 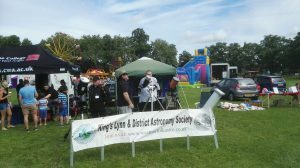 The day was a follow up to a very successful children and parent evening a few weeks earlier with over 150 people present and several telescopes set up outside for everyone to see first hand some of the wonders of the night sky. A very enjoyable evening at Hunstanton for what should have been a Solar observing evening but despite scorching sun all day we were clouded out when we arrived at Hunstanton, bless the English weather. However we still had over 50 people visit us and using the assembled scopes to look at ships on the horizon, talking about astronomy and looking at astro photos on our phones, they all seemed to enjoy the event. We will be back in Hunstanton on 28th September at 8pm for views of the night sky. 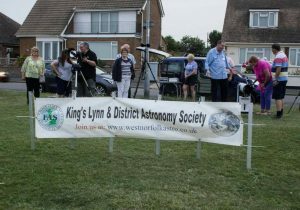 Members at this event were John Craythorne, Leon Askew, Terry Parish and Alan Gosling. Our host for the evening was Rosie Djurovic from West Norfolk Council who was very pleased with KLADAS’ efforts to entertain and hopefully educate the members of the public. 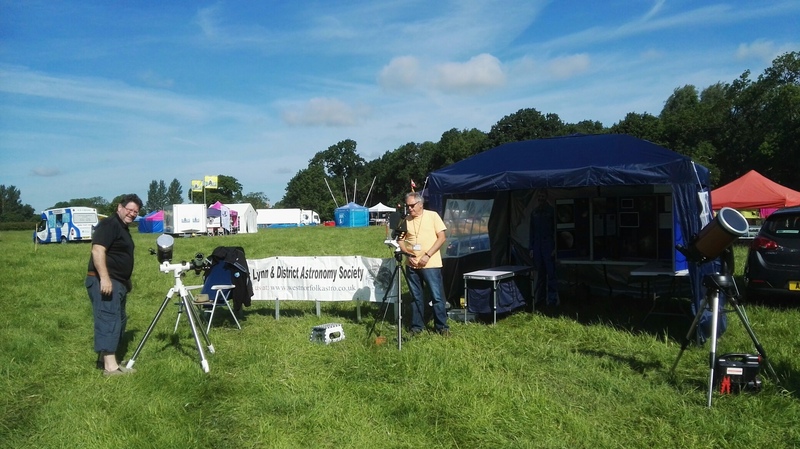 Another outreach event, this time at the Stradsett Country Show held at Stradsett Hall. 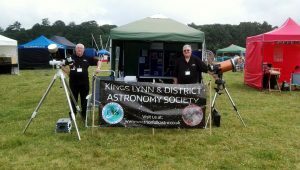 We again had a lot of visitors observing the sun, when it popped out from the clouds, and the display in the gazebo was a great hit with the visitors. The troops on parade this time were Frank Dutton, Terry Parish, Dave Talbot and Alan Gosling. 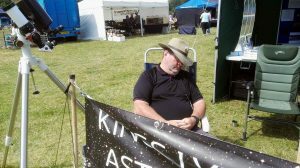 Monday 6th a talk to RAFA Downham Market so of the members here were doing astro navigation before I started astronomy no before I was born. A very enjoyable evening. Tuesday 7th another adult talk and some telescope viewing too for Marshland St James WI. Everyone enjoyed themselves here too. 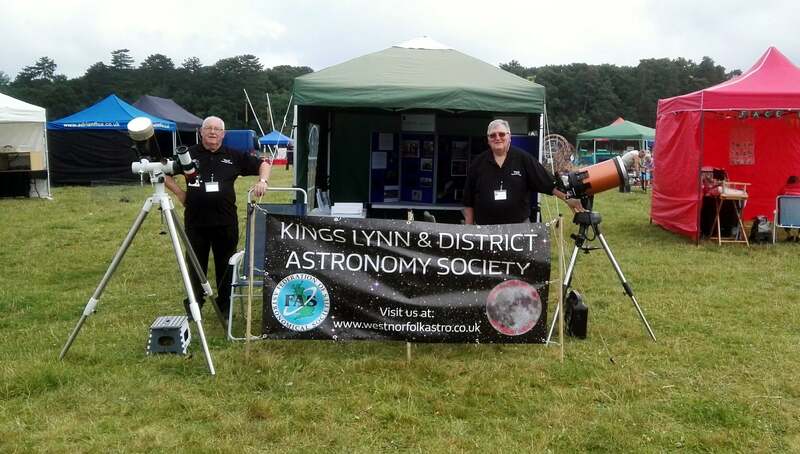 This was a special treat for us with Alan, Leon and john making the trek to deepest and darkest rural Norfolk to give a adult presentation of “Heavens Above” to 25 Guide Leaders and some really dark skies enabled them to see the Moon, Venus, Mars and the great nebula in Orion. Best comment of the evening was “that was so much better than watching a film”. A trip to Upwell and the chance for the cub pack to look at the moon through Alan Gosling’s telescope whilst John Craythorne gave them the Junior version of “Heavens above” taking them on a journey from the solar system to the furthest outreaches of the observable universe. We will go back in March to take them through their Space Activity Badge work. Well our first outreach event of the new season got us off to a flying start. We were invited to do a talk and observation evening for the children of North Runcton Beaver Scout Group as they were having a sleepover at the village hall. John entertained them with one of his wonderful talks while Alan and I got on with setting up our scopes. We were very fortunate with the weather, it was crystal clear skies overhead. 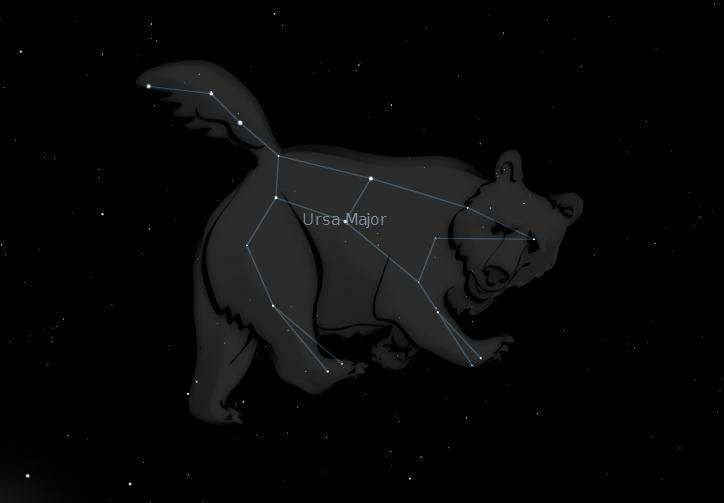 Good old Ursa Major was in full glory and many of our old favourites were shining down on us in all their splendour. When the little ones came out to join us their enthusiasm was very loud!!! John, Alan and myself were kept very busy showing them as much as we could. I think the adults were just as keen as the children. But as usual with children, all interest in the stars above soon disappeared when the laser pens came out, it was all we could do to keep hold of them!! But it was a good start and we all enjoyed ourselves. That’s it for this one, but we are off to Titchwell on Wednesday evening so I will report back on that event later. Wishing you all clear skies! !